The first part of Pierateer SJL's British Pie Week #PiePledge to review a pie in a unique way everyday of British Pie Week 2016. This review sees him take on the famous Clark's Pies in the form of a Potato & Beef pie, see the video below. Overall I like these pies having had a them a few times. Nice and sturdy so they can be eaten by hand. 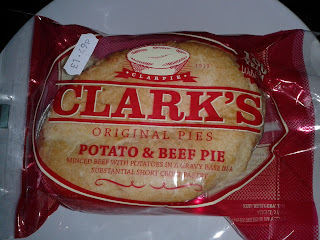 The only other pies I have found with such thick pastry are those from Sweeney and Todd but the Clark's pastry is crunchy rather than gooey. Despite only 6% beef they make it taste nice and meaty. Perhaps the lard used for the pastry helps. Sadly loses marks as the one in the video was quite empty.